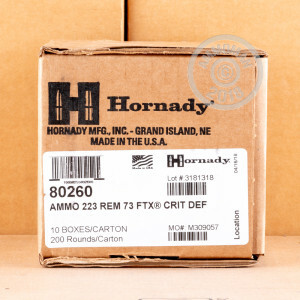 Hornady offers their Critical Defense line of rifle ammunition to deliver the kind of close range terminal performance you need to keep yours and your own safe from whatever kinds of intrusions this uncertain world can throw at you. 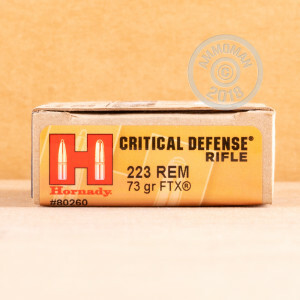 This 223 Rem cartridge features a 73 grain FTX projectile, the Flex Tip technology of which permits the bullet to penetrate heavy clothing while still initiating expansion reliably even at lower velocities. This tech-laden bullet also offers an InterLock ring that mechanically prevents any significant amount of core/jacket separation, and which works in conjunction with its heavy jacket to control expansion and improve accuracy. This self-defense round also offers a nickel plated brass casing, which feeds and ejects smoothly, resists corrosion, and is easily visible for chamber checks in low light environments. The round’s optimized propellant reduces felt recoil and limits muzzle flash, so you won’t be blinded after your first shot if you ever implement it in the dark. 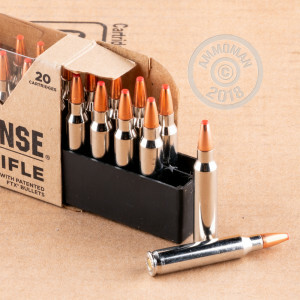 If you ever have to fire your AR-15 in self-defense, you’ll be glad to have invested in 20 rounds designed specifically for that scenario.